Spring is here! My salads are back. I always feel better when I am eating more salads. When I was in college I found a book in the library that had a series of questions written to a doctor in the early 1900s and posted in a newspaper. The answer to many of the various problems was to include 1-2 tablespoons for apple cider vinegar in the diet. This is part of how I got started in natural medicine: it made sense to me that diet impacts health because I know that I feel better when I add some acidity (apple cider vinegar, lemon juice, or lime juice) to my diet a few times a week. I have been poking around PubMed, the free-to-all medical literature search engine, to piece together why apple cider vinegar has been used throughout history for both physical and mental health. This year in the Journal of Food Medicine (see links below), apple cider vinegar has been shown to reduce malondialdehyde levels. Malondialdehye levels are a marker for inflammation. Studies have demonstrated that it is elevated in major depression, social anxiety, ADHD, schizophrenia, and bipolar, as well as cardiovascular disease and diabetes. Clinically, I use it to help start digestion for various GI challenges. A little cider vinegar in water before a meal increases the gastric acid in the stomach and gets digestion going. I have also had patients use it, along with garlic and ginger, to prevent colds and flus. But, lets get back to spring salads and using apple cider vinegar. Braggs Organic Apple Cider Vinegar is the only one that I have found that is both unfiltered and unpasteurized. I also like Trader Joes’ Organic Apple Cider which is unfiltered but pasteurized. I love making my own salad dressing because then I know what is in it and I can use olive oil which is better than the oils often used in commercial salad dressing. And I can make any number of salad dressings with lots of different flavors! 1. 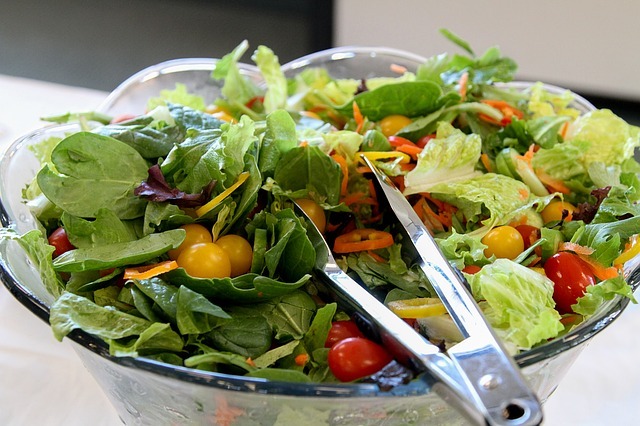 Dressing salads results in eating more veggies. 2. Mixed with water, it makes a good stomach elixir for digestive problems. Mix 1 tablespoon in 1/8 cup of water before meals. Try this for 5 days to see if gastric reflux decreases and energy and mental clarity increases. Over time it will also help the absorption of iron and B12. 3. Mixed with water, ginger and honey, it helps slow down or prevent colds. Mix 1-2 tablespoons in a cup of hot water with grated ginger and 1 tablespoon for honey, drink 1-3 times at first symptoms of a cold. 4. It lessens nigh-time leg cramps. Mix 1 -2 tablespoons in a cup of hot water with grated ginger and 1 tablespoon for honey. Try for one week to see the effects. Although these seem like a large range of challenges, apple cider vinegar works because it decreases inflammation – a driving force behind these and many other ailments. Let us know how you use it and how it works for you.